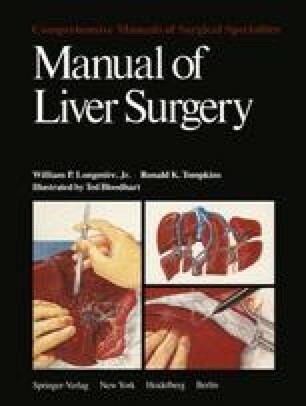 At the present time it is generally recognized that the technical approach used for elective hepatic resection is different from that used in resections performed on an emergency basis, usually for extensive fracture of the liver from trauma. In the elective case, preoperative studies generally have identified the character of the lesion to be resected. The blood supply of the lesion, as well as that of the surrounding liver tissue and the lobe, has been accurately identified by selective arteriography. The type of incision can be carefully evaluated on the basis of the various factors to be discussed below, and the hepatic lesion itself can be approached without concern for other possible intra-abdominal lesions.